This chapter covers a number of basic services that are common to many Unix systems. All administrators should be familiar with them. When you boot the computer, the many messages scrolling by on the console display many automatic initializations and configurations that are being executed. Sometimes you may wish to slightly alter how this stage works, which means that you need to understand it well. That is the purpose of this section. First, the BIOS takes control of the computer, detects the disks, loads the Master Boot Record, and executes the bootloader. The bootloader takes over, finds the kernel on the disk, loads and executes it. The kernel is then initialized, and starts to search for and mount the partition containing the root filesystem, and finally executes the first program — init. Frequently, this “root partition” and this init are, in fact, located in a virtual filesystem that only exists in RAM (hence its name, “initramfs”, formerly called “initrd” for “initialization RAM disk”). This filesystem is loaded in memory by the bootloader, often from a file on a hard drive or from the network. It contains the bare minimum required by the kernel to load the “true” root filesystem: this may be driver modules for the hard drive, or other devices without which the system cannot boot, or, more frequently, initialization scripts and modules for assembling RAID arrays, opening encrypted partitions, activating LVM volumes, etc. Once the root partition is mounted, the initramfs hands over control to the real init, and the machine goes back to the standard boot process. The “real init” is currently provided by systemd and this section documents this init system. systemd is a relatively recent “init system”, and although it was already available, to a certain extent, in Wheezy, it has only become the default in Debian Jessie. Previous releases relied, by default, on the “System V init” (in the sysv-rc package), a much more traditional system. We describe the System V init later on. This book describes the boot system used by default in Debian Jessie (as implemented by the systemd package), as well as the previous default, sysvinit, which is derived and inherited from System V Unix systems; there are others. file-rc is a boot system with a very simple process. It keeps the principle of runlevels, but replaces the directories and symbolic links with a configuration file, which indicates to init the processes that must be started and their launch order. The upstart system is still not perfectly tested on Debian. It is event based: init scripts are no longer executed in a sequential order but in response to events such as the completion of another script upon which they are dependent. This system, started by Ubuntu, is present in Debian Jessie, but is not the default; it comes, in fact, as a replacement for sysvinit, and one of the tasks launched by upstart is to launch the scripts written for traditional systems, especially those from the sysv-rc package. There are also other systems and other operating modes, such as runit or minit, but they are relatively specialized and not widespread. 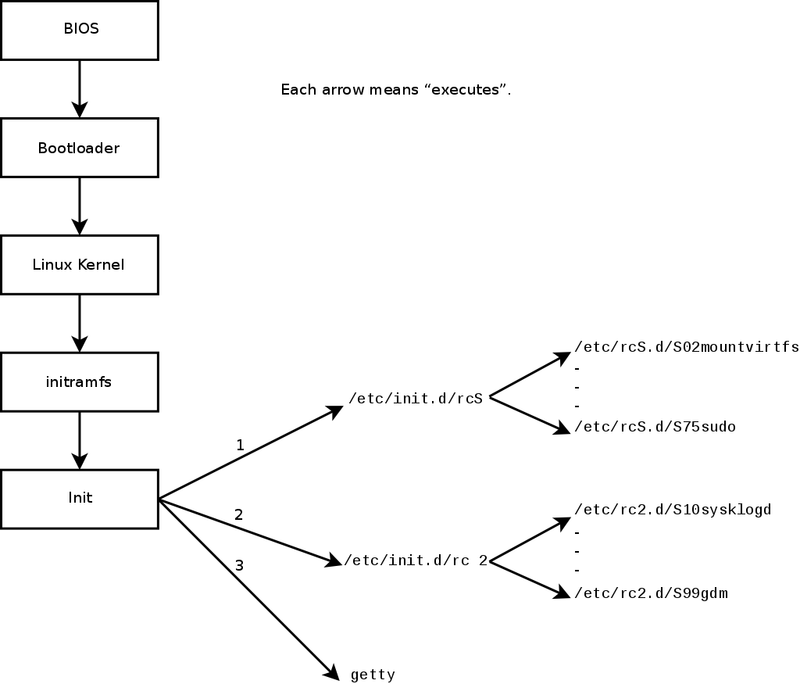 In some configurations, the BIOS may be configured not to execute the MBR, but to seek its equivalent on the network, making it possible to build computers without a hard drive, or which are completely reinstalled on each boot. This option is not available on all hardware and it generally requires an appropriate combination of BIOS and network card. Booting from the network can be used to launch the debian-installer or FAI (see Section 4.1, “Installation Methods”). A process is the representation in memory of a running program. It includes all of the information necessary for the proper execution of the software (the code itself, but also the data that it has in memory, the list of files that it has opened, the network connections it has established, etc.). A single program may be instantiated into several processes, not necessarily running under different user IDs. By convention, the first process that is booted is the init program (which is a symbolic link to /lib/systemd/systemd by default). However, it is possible to pass an init option to the kernel indicating a different program. Any person who is able to access the computer can press the Reset button, and thus reboot it. Then, at the bootloader's prompt, it is possible to pass the init=/bin/sh option to the kernel to gain root access without knowing the administrator's password. To prevent this, you can protect the bootloader itself with a password. You might also think about protecting access to the BIOS (a password protection mechanism is almost always available), without which a malicious intruder could still boot the machine on a removable media containing its own Linux system, which they could then use to access data on the computer's hard drives. 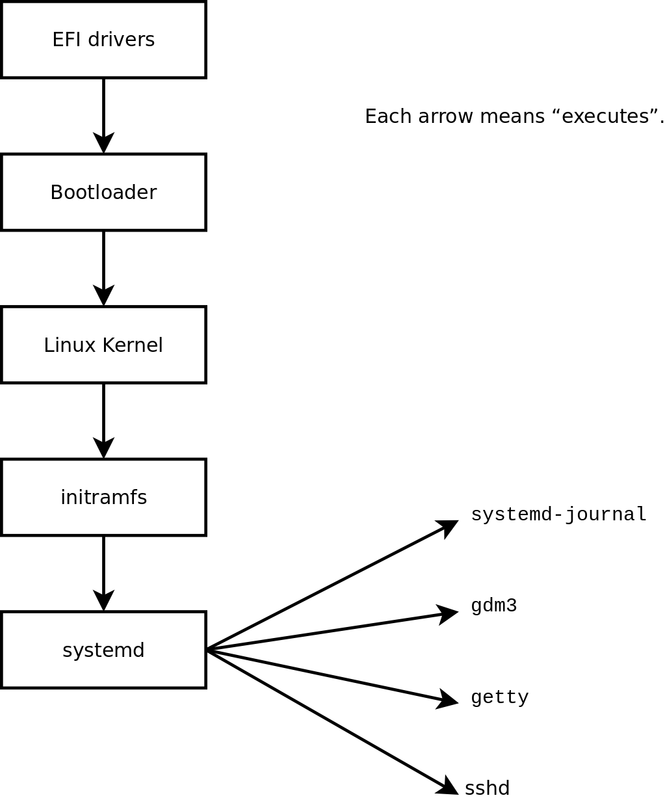 Systemd executes several processes, in charge of setting up the system: keyboard, drivers, filesystems, network, services. It does this while keeping a global view of the system as a whole, and the requirements of the components. Each component is described by a “unit file” (sometimes more); the general syntax is derived from the widely-used “*.ini files“ syntax, with key = value pairs grouped between [section] headers. Unit files are stored under /lib/systemd/system/ and /etc/systemd/system/; they come in several flavours, but we will focus on “services” and “targets” here. As you can see, there is very little code in there, only declarations. Systemd takes care of displaying progress reports, keeping track of the processes, and even restarting them when needed. A systemd “target file” describes a state of the system, where a set of services are known to be operational. It can be thought of as an equivalent of the old-style runlevel. One of the targets is local-fs.target; when it is reached, the rest of the system can assume that all local filesystems are mounted and accessible. Other targets include network-online.target and sound.target. The dependencies of a target can be listed either within the target file (in the Requires= line), or using a symbolic link to a service file in the /lib/systemd/system/targetname.target.wants/ directory. For instance, /etc/systemd/system/printer.target.wants/ contains a link to /lib/systemd/system/cups.service; systemd will therefore ensure CUPS is running in order to reach printer.target. Since unit files are declarative rather than scripts or programs, they cannot be run directly, and they are only interpreted by systemd; several utilities therefore allow the administrator to interact with systemd and control the state of the system and of each component. The first such utility is systemctl. When run without any arguments, it lists all the unit files known to systemd (except those that have been disabled), as well as their status. systemctl status gives a better view of the services, as well as the related processes. If given the name of a service (as in systemctl status ntp.service), it returns even more details, as well as the last few log lines related to the service (more on that later). Starting a service by hand is a simple matter of running systemctl start servicename.service. As one can guess, stopping the service is done with systemctl stop servicename.service; other subcommands include reload and restart. To control whether a service is active (i.e. whether it will get started automatically on boot), use systemctl enable servicename.service (or disable). is-enabled allows checking the status of the service. Another useful command-line flag is -f, which instructs journalctl to keep displaying new messages as they are emitted (much in the manner of tail -f file). After checking the status of the service (failed), we went on to check the logs; they indicate an error in the configuration file. After editing the configuration file and fixing the error, we restart the service, then verify that it is indeed running. socket activation: a “socket” unit file can be used to describe a network or Unix socket managed by systemd; this means that the socket will be created by systemd, and the actual service may be started on demand when an actual connection attempt comes. This roughly replicates the feature set of inetd. See systemd.socket(5). timers: a “timer” unit file describes events that occur with a fixed frequency or on specific times; when a service is linked to such a timer, the corresponding task will be executed whenever the timer fires. This allows replicating part of the cron features. See systemd.timer(5). network: a “network“ unit file describes a network interface, which allows configuring such interfaces as well as expressing that a service depends on one particular interface being up. The System V init system (which we'll call init for brevity) executes several processes, following instructions from the /etc/inittab file. The first program that is executed (which corresponds to the sysinit step) is /etc/init.d/rcS, a script that executes all of the programs in the /etc/rcS.d/ directory. Kernel modules also have options that can be configured by putting some files in /etc/modprobe.d/. These options are defined with directives like this: options module-name option-name=option-value. Several options can be specified with a single directive if necessary. These configuration files are intended for modprobe — the program that loads a kernel module with its dependencies (modules can indeed call other modules). This program is provided by the kmod package. After this stage, init takes over and starts the programs enabled in the default runlevel (which is usually runlevel 2). It executes /etc/init.d/rc 2, a script that starts all services which are listed in /etc/rc2.d/ and whose names start with the “S” letter. The two-figures number that follows had historically been used to define the order in which services had to be started, but nowadays the default boot system uses insserv, which schedules everything automatically based on the scripts' dependencies. Each boot script thus declares the conditions that must be met to start or stop the service (for example, if it must start before or after another service); init then launches them in the order that meets these conditions. The static numbering of scripts is therefore no longer taken into consideration (but they must always have a name beginning with “S” followed by two digits and the actual name of the script used for the dependencies). Generally, base services (such as logging with rsyslog, or port assignment with portmap) are started first, followed by standard services and the graphical interface (gdm3). This dependency-based boot system makes it possible to automate re-numbering, which could be rather tedious if it had to be done manually, and it limits the risks of human error, since scheduling is conducted according to the parameters that are indicated. Another benefit is that services can be started in parallel when they are independent from one another, which can accelerate the boot process. init distinguishes several runlevels, so it can switch from one to another with the telinit new-level command. Immediately, init executes /etc/init.d/rc again with the new runlevel. This script will then start the missing services and stop those that are no longer desired. To do this, it refers to the content of the /etc/rcX.d (where X represents the new runlevel). Scripts starting with “S” (as in “Start”) are services to be started; those starting with “K” (as in “Kill”) are the services to be stopped. The script does not start any service that was already active in the previous runlevel. Level 0 is only used temporarily, while the computer is powering down. As such, it only contains many “K” scripts. Level 1, also known as single-user mode, corresponds to the system in degraded mode; it includes only basic services, and is intended for maintenance operations where interactions with ordinary users are not desired. Level 2 is the level for normal operation, which includes networking services, a graphical interface, user logins, etc. Level 6 is similar to level 0, except that it is used during the shutdown phase that precedes a reboot. Other levels exist, especially 3 to 5. By default they are configured to operate the same way as level 2, but the administrator can modify them (by adding or deleting scripts in the corresponding /etc/rcX.d directories) to adapt them to particular needs. All the scripts contained in the various /etc/rcX.d directories are really only symbolic links — created upon package installation by the update-rc.d program — pointing to the actual scripts which are stored in /etc/init.d/. The administrator can fine tune the services available in each runlevel by re-running update-rc.d with adjusted parameters. The update-rc.d(1) manual page describes the syntax in detail. Please note that removing all symbolic links (with the remove parameter) is not a good method to disable a service. Instead you should simply configure it to not start in the desired runlevel (while preserving the corresponding calls to stop it in the event that the service runs in the previous runlevel). Since update-rc.d has a somewhat convoluted interface, you may prefer using rcconf (from the rcconf package) which provides a more user-friendly interface. The maintainer scripts for Debian packages will sometimes restart certain services to ensure their availability or get them to take certain options into account. The command that controls a service — service service operation — doesn't take runlevel into consideration, assumes (wrongly) that the service is currently being used, and may thus initiate incorrect operations (starting a service that was deliberately stopped, or stopping a service that is already stopped, etc.). Debian therefore introduced the invoke-rc.d program: this program must be used by maintainer scripts to run services initialization scripts and it will only execute the necessary commands. Note that, contrary to common usage, the .d suffix is used here in a program name, and not in a directory. Finally, init starts control programs for various virtual consoles (getty). It displays a prompt, waiting for a username, then executes login user to initiate a session. The first computers were usually separated into several, very large parts: the storage enclosure and the central processing unit were separate from the peripheral devices used by the operators to control them. These were part of a separate furniture, the “console”. This term was retained, but its meaning has changed. It has become more or less synonymous with “terminal”, being a keyboard and a screen. With the development of computers, operating systems have offered several virtual consoles to allow for several independent sessions at the same time, even if there is only one keyboard and screen. Most GNU/Linux systems offer six virtual consoles (in text mode), accessible by typing the key combinations Control+Alt+F1 through Control+Alt+F6. By extension, the terms “console” and “terminal” can also refer to a terminal emulator in a graphical X11 session (such as xterm, gnome-terminal or konsole).